AUTHORS: A. van Engelen, R. Keisler, O. Zahn, et al. Our understanding of the universe in which we live has been transformed over the past two decades. Much of this transformation is the result of extremely precise measurements of the cosmic microwave background (CMB), the ubiquitous afterglow of the Big Bang that fills the universe nearly uniformly. As it turns out, the qualifier ‘nearly’ is extremely important. There are slight (1 part in 100,000) variations in the temperature of the CMB photons, and the properties of these variations give us direct information about the very, very early universe. This information has been instrumental in developing the standard cosmological picture, known as the model. As CMB photons travel through the universe on their way to a telescope’s collecting dish, the large-scale distribution of matter deflects their paths by roughly 3 arcminutes through the process of gravitational lensing, leaving a distinct non-Gaussian signature on the CMB. This signature provides yet another source of cosmological information, but until recently, CMB experiments lacked the sensitivity and resolution required for a detection. However, the authors of this work use data from the South Pole Telescope (SPT) to detect the non-Gaussian effects of lensing on the CMB at high statistical significance. The total deflection angle of a CMB photon in a given direction on the sky is sensitive to the projected gravitational potential along the line of sight, which is denoted by . The statistic measured by the authors in this analysis is the power spectrum of this projected potential, , which quantifies the amplitude of the lensing effects as a function of multipole . The multipole number is similar to the frequency of a wave, in that a larger multipole number corresponds to fluctuations of a smaller physical scale (roughly the relation holds, where is the angle on the sky). The measured power spectrum from the SPT data is shown in the figure to the left. 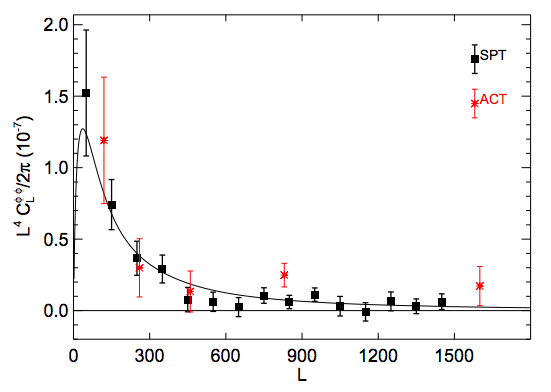 The figure also shows results from the Atacama Cosmology Telescope (ACT), which reported the first detection of the CMB lensing power spectrum last year. The authors find that their results disfavor a cosmological model with no CMB lensing at a significance of . The ratio of the measured amplitude of the lensing signal to that expected in a standard universe is found to be . Thus, the SPT detection is consistent with the standard cosmological model. The CMB lensing signal measured by the authors is sensitive to matter fluctuations over a fairly large redshift range, , and on very large physical scales. This enables a measurement of CMB lensing to be used to constrain cosmological parameters, specifically the curvature of the universe, the nature of dark energy, and the amplitude of matter fluctuations. The first cosmological constraints from CMB lensing came from the ACT lensing detection and are summarized nicely in this astrobite. In particular, a detection of CMB lensing can break a ‘geometric degeneracy’ that exists in the measurements of the primary CMB temperature anisotropies by experiments such as WMAP. 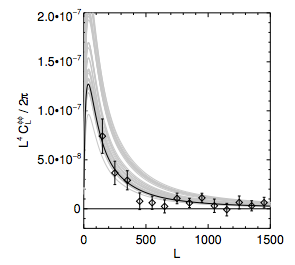 The data from WMAP allow for a wide range of possible spatial curvatures, but the CMB lensing power spectrum is much more sensitive to the curvature of the universe, as demonstrated by the figure to the right. 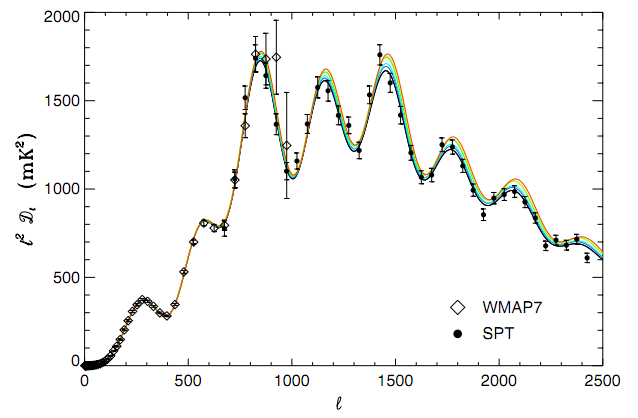 The authors find a factor of 3.9 improvement in the measurement of the curvature of the universe when compared to the constraints from the 7-year WMAP data (WMAP7). They find that the curvature parameter is consistent with a flat universe, . The addition of CMB lensing data is also able to improve constraints on the amplitude of matter fluctuations by 10% over WMAP7 data alone, . The parameter is defined as the root mean square mass fluctuation amplitude in randomly chosen spheres of radius Mpc. Furthermore, when combined with other external data sets, the SPT CMB lensing detection improves the measurement of the dark energy equation of state by 15%, giving (the simplest theoretical models for dark energy tend to favor ). The detections of CMB lensing and derived parameter constraints by the SPT and ACT collaborations indicate that CMB lensing can be used as a powerful cosmological tool. Upcoming results using data from the full SPT survey and the Planck collaboration must carefully consider systematic uncertainties but are expected to yield even more accurate measurements of CMB lensing. Future experiments such as SPTpol, ACTpol, and PolarBear will also measure CMB lensing with great precision, helping to push our knowledge of the universe ever forward.